Panasonic CF-29 Ruggedised Toughbook is a rugged notebook computer designed using MIL-STD-810F test procedures to meet exhaustive U.S. Military durability requirements, and features vibration and drop plus shock resistant design, full magnesium alloy case with handle, shock-mounted hard disk drive (HDD), durable keyboard, water and dust proof, heat dissipation system based on heat pipe technology, strong and secure port connectors, extra bright active matrix (TFT) color LCD panel that surrounded with dampers and mounted in a shock absorbing magnesium display casing, and comes with new energy battery which lasts 1.5 times longer. CF-29 Toughbook is powered by Intel Centrino Mobile Technology processor. TrustedReviews reviews Panasonic CF-29 Toughbook and concludes with overall rating of 9 out of 10 that the ToughBook CF-29 is a very special notebook indeed – it lets you work almost anywhere, in almost any conditions. Whether you drop it, pour water on it, or throw sand on it, the CF-29 will just keep going and act as if nothing has happened. The performance score given to the CF-29 relates more to its amazing battery life and almost indestructible resilience than it does to the speed of application execution – after all that’s what performance means with a product like this. 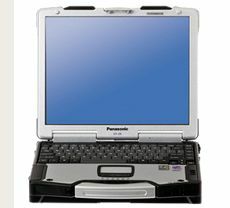 Ultimately, if you ever wondered how Panasonic came up with the ToughBook name, just take a look at the CF-29.